What is the cement outlook in SA? PPC is trading at a level that makes me reach for me Black jack n' rum. I am not to familiar with the cement industry and might be hangin' me self by the Hempen halter. Dangote in Nigeria might swoop in, I don't know. I'm also looking at throwing some spare cash into the cement pit, but i think it should be cash once is willing to part with should the brown stuff hit. My argument is haters gonna hate, buildings gonna be building. And to build you need iron and you need cement. What is that massive new development they are planning to build outside of Cape Town? Surely that will spur a bit of interest and demand in the market? I am also looking at PPC. I haven't been following PPC for that long, but from what I've read they have been investing heavily into Africa, with around 6 - 8 new ventures coming online in the near future. At least that's how I understood it all, for this reason I have dumped a lump sum into them. Will hopefully grow into a nice little nest egg in the next 5 years or so. Hmmm I wonder how low this share can go, already thought its at an all time low 5 days ago, but it just keeps dropping more and more. I am also watching this share. I have google alerts set up the works. Revenue for the interim period dropped by 1% to R4.501 billion (2015: R4.541 billion). Gross profit was 7% lower at R1.2 billion (2015: R1.3 billion). Operating profit decreased by 3% to R733 million (2015: R756 million). Profit for the period attributable to shareholders of PPC Ltd. rose by 35% to R369 million (2015: R274 million). Furthermore, headline earnings per share were recorded at 53 cents per share (2015: 60 cents per share). In the short to medium term PPCÆs focus is on consolidating current expansion projects and operational efficiency initiatives introduced in the past 18 months, stabilising the company and ensuring it is able to deliver on its strategic priorities. The group has made changes to its operating structure to ensure that it has the appropriate business model to deliver on its long-term growth strategy. Two key changes include the establishment of the materials business division, noted earlier, and a new commercial function. The materials business division is focused on expanding PPCÆs product range and service offering in aggregates, readymix, fly ash, lime and related businesses. Progress to date includes the imminent acquisition of 3Q Mahuma Concrete, the largest independently owned readymix concrete supplier in southern Africa. The new commercial function is intended to create and entrench an increased commercial perspective to facilitate PPCÆs aim to become a world-class provider of materials and solutions. A dedicated project management office now operates from this division to ensure the company realises its aspirations. The Board approved a corporate restructure to streamline and optimise the South African and foreign operations, effective 1 April 2016. As a consequence, the legal structures and management accountability are fully aligned and Project Omega is now substantially complete. PPCÆs 2008 broad-based black economic empowerment transaction (B-BBEE 1) matures in December 2016, however discussions to accelerate the unwind of B-BBEE 1 continues. Under the revised Department of Trade and IndustryÆs broad-based black economic empowerment codes of good practice, PPC was rerated from a level 2 contributor to level 8 in December 2015. We had anticipated this outcome and management plans to improve our B-BBEE score to level 4 over the next three years. This rating will enable our customers to claim back 100% of their spending with our group for their own preferential procurement points. To reach level 4, the company will focus on improving the score in the categories of management control, skills development, and enterprise and supplier development. @780 cents ... I want to take a plunge and buy. Well I bought 512 shares. Lets hope. Sold mine just now: 14% profit! score! Those that have not bought yet. Might be to late now. PPC, South Africa’s largest publicly traded cement maker, said it received R4 billion ($263 million) of bank guarantees to underwrite the sale of shares to existing investors, adding to facilities it received last week to redeem bonds. A group of lenders including Standard Bank Group, Nedbank Group, FirstRand’s Rand Merchant Bank and Barclays Plc’s Absa will lead the rights-offer process and provide the standby underwriting commitment, Johannesburg-based PPC said in a statement on Monday. Standard Bank was appointed as sole global coordinator. The agreement comes after PPC on Friday announced that it obtained R2 billion of guarantees from Absa, FirstRand and Standard Bank to back the early redemption of bonds. PPC is being forced to raise funds after S&P Global Ratings cut its credit rating to junk amid rising debt due to investment in new African projects, combined with a difficult trading environment in its home market. PPC shares gained 5.5% to R7.93 as of 9:07am in Johannesburg, following three days of losses. The stock has almost halved in 2016, the worst performer on the FTSE/JSE Africa All-Share Index. Saw PPC got downgraded to junk over night. A seven-notch downgrade is quite extreme and can conceivably come as a shock to both the issuer and investors. Therefore, this situation begs the question: what went wrong? It seems that in 2015, PPC became aware that it would need more capital in the future, and even considered a capital raise in September. As part of its planning process, the company mandated the commercial (that is, non-rating) unit of S&P to come up with a dummy rating in order for PPC to determine the potential value of any capital- raising initiative. Unfortunately for PPC, the information gathered as part of this exercise was subsequently used by the S&P ratings arm to trigger an “event-driven review”, which then resulted in the company’s downgrade to junk status. What makes it worse, is that PPC was unaware of the acceleration clause in its DMTN programme. Anyone else still riding this out? Haven't really been monitoring the share itself, but doesn't seem like it's going anywhere fast. PPC, Do you guys think it is worth climbing in? What is the latest news on them that affects their share price? If it touches 600 cents I will climb in. See PPC share performance in graph attached. They are not growing in South Africa and struggle to grow revenue elsewhere in Africa. Unless they can find growth the share will just drag along and remain cheap due to EPS depression. I'm feeling a bit more optimistic as I think their non SA branches has far more room for growth as those countries still have around 4 - 8 percent GDP growth, plus most of them have only recently come online, with some near to completion. Their revenue can only increase from here since they spent a ton of money developing and deploying these new revenue streams. deliver compelling benefits for all stakeholders. such time a further announcement is made. investors and analysts and then open the floor to questions. Ask to be joined to the PPC investor and analyst conference call. on the live conference call. 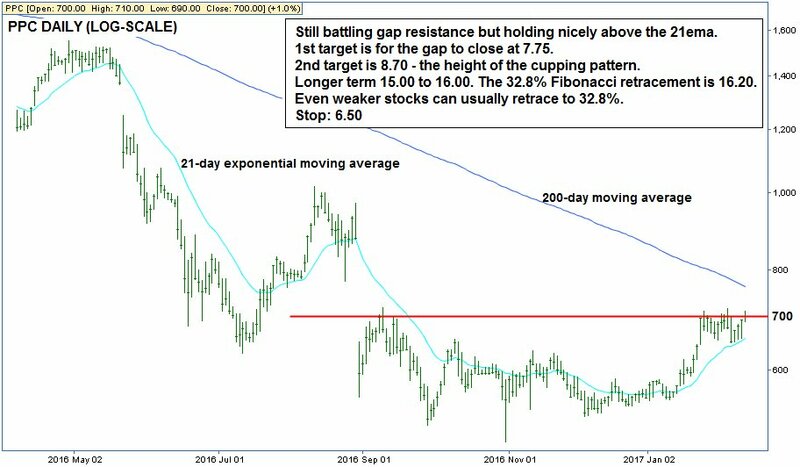 PPC: R7.00 remains a crucial level.